The wedding is over; the reception has reached the point at which it's time for you and your new groom to make the perfect exit to what has already been a fantastic day. But, you want more than the usual gauntlet of guests waiting to congratulate you, hug you, shake hands, and give you a nice send-off. Our 10" wedding sparklers are a great way to add the finishing touch to your special day. Since these wedding sparklers only burn for 40 seconds, they are ideal for use during your send-off. 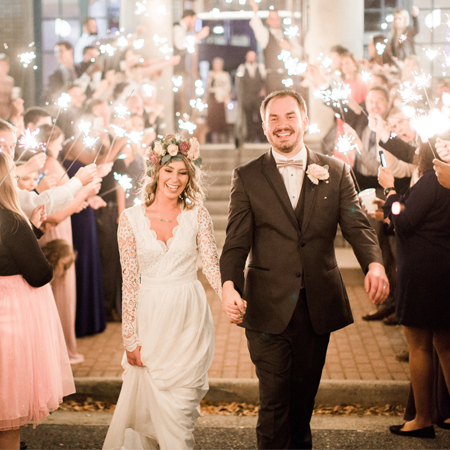 Wedding sparklers are a great way to add a touch of glowing light to your exit. Your guests can hold them aloft, creating a tunnel through which you must pass in order to leave. One of the most challenging issues with the average wedding send-off is that it never seems to end. While you and your new spouse are trying to move it along as quickly as possible, your guests seem to want to keep the two of you hanging around as long as possible. One of the top reasons to use our 10" wedding sparklers is that the only burn for approximately 40 seconds. This means if the two of you want to reach the end of the gauntlet, you need to hustle, and your guests will try to rush you along instead of slow you down. But, of course, you can slow down the procession by having your guests spread out how long it takes for those at the end of the line to light their wedding sparklers. Our 10" wedding sparklers are designed to be safe for all ages to handle, but you should still have someone in charge of handing them out and keeping a close eye on any children that are allowed to use them. No matter how safe our wedding sparklers are, they do burn at a very high temperature, so be mindful of little ones. The person or persons you have put in charge of handing out the 10" wedding sparklers should also be in charge of making sure they all make it back. This way they can be put in a bucket of cold water to cool off the stems and keep everyone safe. At the Wedding Sparklers Outlet, we offer 10-, 20-, and 36-inch wedding sparklers for you to choose from along with 11-inch heart-shaped sparklers. All of our sparklers are virtually smoke-free and safe for use indoors and out. If you are ready to learn more about our wedding sparklers, the best way to do so is to visit the Wedding Sparklers Outletonline. Here you can browse our 10" wedding sparklers along with the rest of our wedding sparklers and confetti cannons.